Rossville is aiming for its third consecutive Class 3A state championship. Let’s take a look at each classification and the reigning champs chances of defending their crown. The Derby Panthers have their sights set on a second consecutive Class 6A state championship and their third title in four seasons. With coach Brandon Clark back to lead to the Panthers and a strong contingent of talented returning players on each side of the ball, the goal is a realistic one. While Derby graduated quarterback Brady Rust, who passed for 1,730 yards and rushed for 2,118 last season, the Panthers maintain several quality receiving targets. Kenyon Tabor has already verbally committed to play for the Kansas Jayhawks, and wide receiver Kai Lemons is being recruited by such schools as Arkansas, Kansas, Kansas State, Michigan State and Oklahoma State. Defense will likely be the Panthers’ strength as seven starters return to a unit that limited opponents to two touchdowns or fewer in six of 13 games last season. Defensive tackle Peerlus Walker is set to return after earning Kpreps.com All-State honors in 2015. The 6-foot-1, 260-pound senior posted 44 tackles and 5.5 sacks. Derby, which finished 12-1 last year and beat Blue Valley in the state championship game, opens the season Friday at home against Goddard-Eisenhower. The Panthers are ranked No. 1 in Kpreps.com’s Class 6A preseason rankings. Mill Valley captured the 5A title last year with a 35-14 win over Bishop Carroll, but the Jaguars graduated eight players who earned Kpreps.com All-State honors last year. Among the graduated honorees was quarterback Logan Koch, who passed for 2,483 yards and 32 touchdowns, and Kansas Gatorade Player of the Year, Christian Jegen. While the losses prevent the Jaguars from being the preseason favorite, they still enter the season ranked No. 3 in 5A. Mill Valley returns only four starters on offense and two on defense, but the team remains a veteran group with 23 seniors. The new starters will be tested early as Mill Valley has joined a stacked Eastern Kansas League. The Jaguars open the season Friday night against 5A’s fourth-ranked St. James Academy. Mill Valley’s other regular season opponents include Class 6A’s third-ranked Blue Valley, 5A’s second-ranked St. Thomas Aquinas and Class 4A Division I’s top-ranked Bishop Miege. Bishop Miege doesn’t rebuild. Instead, the Stags reload. After winning the past two Class 4A D-I state titles, the Stags enter the season ranked No. 1 again. The Stags graduated three Kpreps.com All-State players from last year, but they also return three in quarterback Carter Putz, wide receiver Jafar Armstrong and offensive lineman Colin Grunhard. Putz completed 69 percent of his passes, throwing for nearly 3,200 yards with 36 touchdowns and only five interceptions. Armstrong, who caught 65 passes for 1,262 yards and 15 touchdowns last season, has verbally committed with the Missouri Tigers. Grunhard, the son of former Kansas City Chiefs player Tim Grunhard, is considering such schools as Air Force, Colgate and South Dakota. Defensive back Djimon Colbert, who transferred from Winnetonka (Mo. ), has committed to the Iowa Hawkeyes. 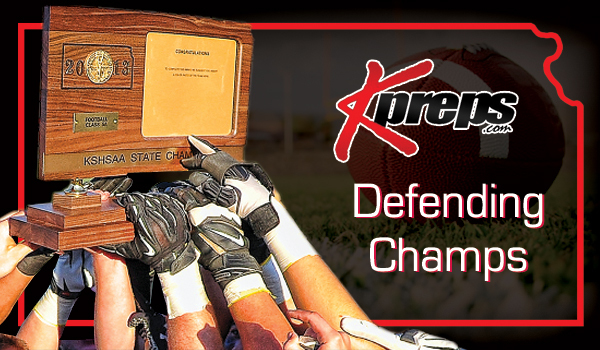 The Eastern Kansas League, which is full of 6A and 5A schools, is great preparation for the 4A D-I playoffs. Bishop Miege opens the season on Friday at Class 6A’s third-ranked Blue Valley. Holcomb graduated three Kpreps.com All-State players on offense, including quarterback Trey Teeter. However, the Longhorns return two of three All-State defensive players to a unit that was dominant in 2015. Holcomb’s defense allowed only 134 points all of last season. Defensive lineman Conner VanCleave, who is a lanky 6-foot-6 and 215 pounds, recorded 78 tackles, seven sacks and three interceptions. Linebacker Dillon Williams posted 145 tackles, including five sacks. The Longhorns aren’t the preseason favorite, but they do open the rankings at No. 3 behind new 4A-II members Topeka Hayden and Scott City. Despite graduating the 2015 Dylan Meier Get Busy Livin’ Player of the Year in quarterback Tucker Horak, Rossville has a legitimate chance to win its third Class 3A state championship in a row. Rossville, which returns five starters on offense and five on defense, is ranked No. 1 in 3A. The Bulldogs return a pair of Kpreps.com All-State performers in wide receiver Cole Schumacher and linebacker Dawson Hammes. Schumacher caught 38 passes for 668 yards and 11 touchdowns. Hammes, who also plays running back, posted 159 tackles, including four sacks. He also rushed for 1,111 yards and 10 touchdowns. Phillipsburg, last year’s Class 2-1A state champion, has moved up to Class 3A and opens the season ranked fifth. Troy, which lost 30-29 to Phillipsburg in last year’s state championship game, enters the season ranked No. 1 in 2-1A. Spearville enters the season as one of the championship contenders in 8-Man D-I. Running back Luke Heskamp, who earned Kpreps.com All-State honors last year, rushed for 1,463 yards and 30 touchdowns. The Lancers also return All-State offensive lineman Wyatt Strecker. Spearville is ranked second behind a St. Francis team that returns a bevy of talent. No team can defend the 8-Man Division II state title as last year’s champion, Victoria, moved up to 8-Man Division I.
Hanover, last year’s 8-Man Division I state runner-up, enters this season as 8-Man Division II’s top-ranked team.